In a sweeping attempt at stopping piracy of their latest movie, a studio has obtained a court order forcing India's ISPs to block some of the world's largest file-sharing sites. A company spokesman gave a SOPA-style reason for their actions, claiming that site blocking is the only way they can stop foreign sites from engaging in "rampant online piracy." 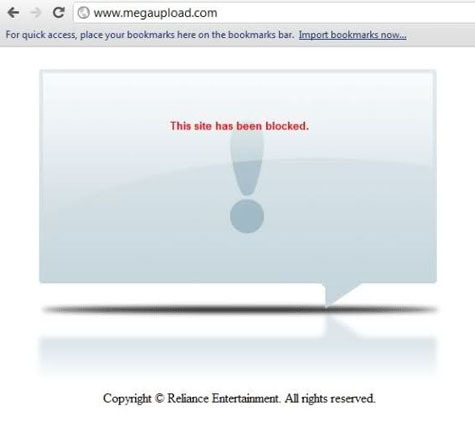 Megaupload says the ban presents a great opportunity for them to test their anti-blocking technologies. As 2011 draws to a close, movie company Reliance Entertainment have demonstrated yet again why corporations should not be trusted to put anyone’s interests above their own when they have powerful censorship tools at their disposal. For the third time this year, Reliance have persuaded India’s High Court to track the responsibility for preventing copyright infringement of their movies right back to the country’s Internet service providers. Reliance told TOI that the blockade was put in place to stop piracy of the company’s latest release, the movie Don 2. However, the company isn’t just having specific torrents or URLs blacklisted, they have succeeded in getting entire domains blocked, SOPA-style. Indeed, their justification could have been written by SOPA proponents. “All websites like Megaupload and Filesonic are located out of India and such sites rampantly promote online piracy. In fact, steps such as the John Doe order are the only step that we copyright owners are left with,” said Reliance spokesman Sanjay Tandon. Perhaps unsurprisingly, one of the first ISPs to respond to the blocking demand was Reliance Communications (Rcom), a situation bemoaned by legitimate cyberlocker customers. “Since Friday morning I can’t access any file-hosting websites. Not all web users are pirates. We share legitimate files through websites like Megaupload and Filesonic. Like photographs we have clicked. Blocking of websites is ridiculous,” said Gaurav Shukla, Reliance Broadband customer and editor of news portal AndroidOS. Commenting on the censorship, Megaupload’s Kim Dotcom told TorrentFreak that the effects of these blocks are usually resolved in a week, but while they stand they give the company a chance to do some analysis. “For us the India block is a great opportunity to see how users respond. In India we have one of the highest installation rates of our Megakey application. It gives users direct access to our servers. The Megakey instantly cures any kind of ISP or DNS blockade and always finds the fastest route to our servers,” Kim adds. While there is little Reliance Entertainment could have done about the leak of a telesync (camcorded, direct audio) version of Don 2, they have only themselves to blame for the almost perfect DVD screener copy currently doing the rounds online. Stats collected by TorrentFreak suggest that in total the movie has been downloaded around 150,000 times on BitTorrent alone – it’s currently hovering around in the Top 15 most popular torrents on The Pirate Bay. Whether this amounts to a “success” for Reliance is a matter for them. It’s worth noting that if all entertainment companies in India took this same action for all of their releases, it would be possible to have all ‘infringing’ sites blocked on a rolling and permanent basis. Considering the SOPA debate during the last few months, that unnerving eventuality will sound worryingly familiar.